Audrey Hepburn 4 May 1929 20 January 1993 British Joseph Victor Anthony Ruston Ella van Heemstra Actor A talented performer known for her beauty, elegance and grace. 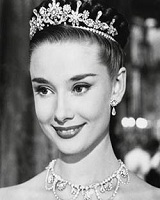 Often imitated, she remains one of Hollywood's greatest style icons. A list of popular Hindi Audrey Hepburn quotes are given below.